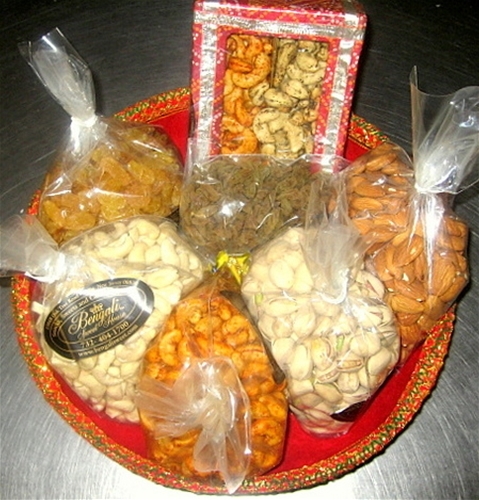 Assorted Premium dry Fruits 4lb. "A tradition of Indian Tokari giving still lives on"
This tokri comprises of carefully selected items that make wonderful presents to give friends and guests alike. Fresh Dry Fruits shipped directly from our kitchen. All Gifts are professionally packed and a personal massage is included with each gift tokri. The basket is Typical Indian designed hand crafted inside-out with a silky fabric. It is uniquely crafted just for Bengali Sweet House and for you to make a statement. Please allow additional one day for this item to ship.